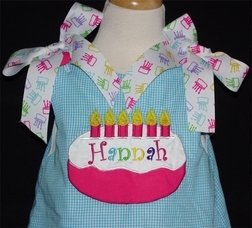 We fell in love with this birthday cake grosgrain ribbon and had to make a birthday outit with it. 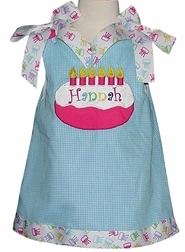 We make your choice of a dress or outfit from beautiful turquoise gingham and the trousers from a solid hot pink with cake ribbon around the hems. You can add pin on bows for the shoulders if you choose. The colors are so pretty-lime green, lavender, yellow, turquoise and hot pink. 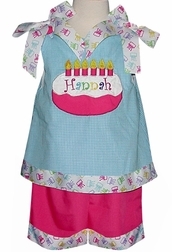 The appliqued cake bottom is made with a hot pink fabric and the candles are also made with the hot pink. Your little one's name is monogrammed across the icing.